Female Marines have already begun proving their combat ability with eighty-five women making it through the infantry training course last fall. But doubts still remain about their ability to meet the same standards a men—a question largely of physical strength. 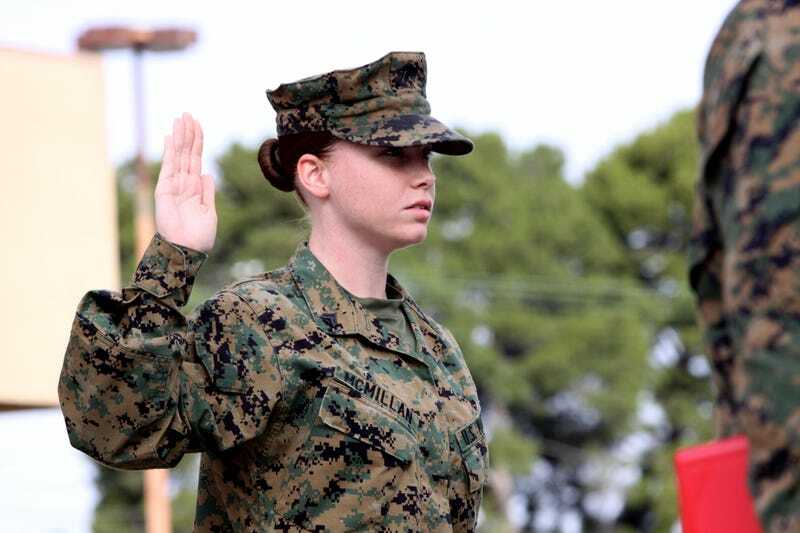 The biggest complaint amongst critics of women in the Marines is that female Marines will be held to different standards than their male counterparts. This issue was magnified earlier this year when the pull-up test for female Marines was pushed back after 55% of female recruits were unable able to complete the three required pull-ups at the time. The most important question is how to open up ground combat jobs to women without sacrificing Marine standards. "Male and female, the task has got to be the same. Combat readiness will not be compromised. If we get this right, combat readiness will improve. And the second thing, we're not going to lower standards," said Marine Lt. Col. Michael Samarov, who's part of the planning team. Katelyn Allison, who is studying the Marines at the Department of Sports Medicine and Nutrition at the University of Pittsburgh, cites the physiological differences between men and women—not as an excuse—but an obstacle that must be overcome. "Females that are small in stature are at a huge disadvantage compared to males," she added, "let's say a male Marine who is 200 pounds or 180 pounds. So that's a huge barrier, and if that's something that's required of everybody, then there's no way around that." Researchers like Allison are focusing on physical training to help narrow the physicality gap as well as identifying injures common to women and how to prevent them. Over the next year, 160 women will take part in intense training that will span across the Mojave Desert, Pacific Coast beaches and the Sierra Nevada mountains. The Marines will march with 100-pound packs, mount an attack that will include tanks, then dig a defensive position. They'll practice pulling a wounded Marine to safety. They'll crawl over obstacles. Climb mountains and cliffs. Col. Anne Weinberg, who is among those at the University of Pittsburgh overseeing the study, is confident that training will prove that the ability of female Marines is equal to that of their males peers: "I think we're going to have lot of female marines who are able to meet those standards," she said.